In reviewing Henry's Wonderful Model T by Clymer coups first appeared in 1915 with rear hinged doors, continuing through to 1924 when the hinges were changed to the front. In reviewing several pictures of 21,22 and 23 models of coupes there is a mixture of front and rear hinges. Were these models wrongly identified or was there a difference in Canadian and US models? The antique car hobby went through several phases during the '30s through the '70s where a lot of distorted memories were taken as fact, and a lot of misinformation came out from that. For some silly reason, the '24/'25 model T coupe got that in huge amounts. Many, many ,many, '24/'25 coupes have been licensed and sworn to be years earlier. Probably a much higher ratio of mistakes than most cars. Convincing people that "Uncle Danial's" famous 1918 model T coupe is actually a 1925 can be difficult and frustrating. They DO NOT want to believe it, despite serial numbers that can be dated to the hour of production, stacks of paper showing features that did not exist until years later, THAT is the car HE drove home from the war and that is all there is to it. So he traded it in a couple years later? They won't believe it. It is the family legend you must understand. There were some earlier Ford coupes, and custom bodies, that can be either way. A very few prototype couplets (folding top) were built in 1914 with front hinged doors. Other than those, all Ford factory offered coupelets and coupes for 1915 model year basically until the end of 1923 model year doors were hinged from the rear and open to the front. They all also have a separate main body with a trunk mounted behind it. The '24/'25 style and the '26/'27 style are considerably different from each other, but the same in that the doors all hinge from the front, and therefore open to the rear. They also all have the trunk made as part of the same body side panel as the passenger area. There are a few confirmed oddities, and a month or two difference for some changes (so I have read), but for the most part, the Canadian coupes stayed right with the USA coupes. The hobby owes a debt of gratitude to Floyd Clymer. He was an automotive pioneer. He was an early collector of automotive history. He was even a founding member and an early president of the Antique Automobile Club of America. But he did make and publish quite a few mistakes. While I cherish several of his books I own, I know to take some of what is in them with the proverbial grain of salt. We know a LOT more today about the history of the model T Ford than was known sixty years ago. I happen to have one of those misidentfied 24 T Coupes. I have most of the inspection tickets up to 53 when it was last inspected before I inherited it years later. The engine no. is late 24 but for several years it was listed as a 25 on about half of the inspection tickets. They were almost identical and a older friend of mine swore it was a 23 when my Father and uncle drug it home when I was 12-13 years old. Re; "1915 model year basically until the end of 1923 model year doors were hinged from the rear and open to the front. They all also have a separate main body with a trunk mounted behind it." The coupes of this era don't have a separate trunk it is built as part of the body unlike the roadster. While the stamping for the 24-27 trunk is part of the rear quarter, the 15(?) to 23 trunk sheet metal and frame go inside the body and is attached to the wood frame that come down the back of the body. You can't remove the trunk for 15(? )-23 without leaving a big hole behind the seat. Thank you Mark for the clarification. You are of course correct. John, Somehow, it is still difficult for me to understand. For so many years Most claimed '23 coupes were the later style. In more recent years, solid evidence began to show that although some were built in late '23, they were clearly '24 models. But that is also a part of your car's history. Cars were often titled as the year in which they were built (and/or sold) back then, rather than by the manufacturer's model year. That leads to much misunderstanding and many arguments even today. 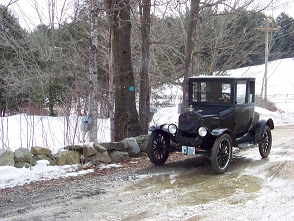 Try telling someone who has a Ford built late in 1909 and always titled as an '09 that he really has a 1910 car. The 23's and 24's cause even more confusion, since Ford began building the high-radiator/cowl '24 model year cars earlier than usual in 1923, before the actual '24 model year began. And with all this talk about Coupes beginning with the '15 models, let's not forget that Ford also made Model T Coupes in the '09 and '10 model years, as well as a Model S Coupe or two. My coupe (that is, the body) was built during the first week of November 1923. It is clearly a 1924 model. I will eventually be running 1923 YOM license plates on it. That should confuse some people.